When creating a website, there are a number of common misconceptions about web design that Chicago web designers hate hearing. The problem with these errors is that they can ruin the appearance of your website and thus your brand, causing you to lose prospective clients. Every aspect of your Internet presence must be considered as you build your site. Our Chicago Web design firm has made a list of 13 common web design mistakes to clear up the confusion. Unfortunately, creating a website is never easy. Just because anyone can purchase a domain and make a basic site doesn’t mean they can do it well. The truth is that Chicago web design is a tough job, and requires countless hours of work not only in making the actual site, but in preparing for it and in maintaining it after. The layout and graphic design in itself is a difficult task, but then there is also content creation, blogging, inbound marketing strategy, social media, and more to take into account. This is why having a Chicago web design company is so useful- every element of the website is handled by one team, with specialists in each category who work together to create a cohesive and effective finished product and manage it accordingly. Second in our list of common web design mistakes is about user perception. Many people think that what they like is what the consumer likes as well. Just because you use your favorite color, use a font that you think is appealing, or blog about a particular subject you find interesting, doesn’t mean that the website visitor will feel the same way. Everyone has different perceptions. The fundamental goal of a website is to build an online presence to attract customers for your business. So, the customer and his needs and interests should be taken into account throughout all of website construction. Sometimes, a website can have too much going on. Special effects like flash intros are great, but they can be problematic for various servers and iPhones and iPads, which do not support this feature. It can also be hard for search engines to pick up your content when it is present on the page. Moreover, having too many add-ons can detract from the purpose and content of your website, or look physically unattractive, turning consumers away from your page and to the next result in the search engines. Look no further than a Chicago web design company to tell you that SEO is essential. Even before a company is finished creating a website, they need to start search engine optimization to start ranking on the search engines. Any Internet marketing expert knows that search engines are the main way that consumers discover businesses and their websites, so the process must start early. Taking on SEO as you go will make the task much easier, get your rankings higher faster, and ultimately get you more customers. Again, this is why our Chicago web designers work as a team with our SEO experts, to deliver clients with the best results. Definitely one of the most frequent of the common misperceptions about web design is the contact information page. Most businesses assume the contact info belongs on the contact page. Every website needs to have a contact information page, but also should have the information in a place that is quickly and easily accessible and appears on every page. Often times, this is the top right corner of the website, but could also be anywhere in the header, or in a side bar, or bottom of a page. Having this information- at least a phone number and email- clearly visible on every screen makes it easy for consumers to reach out to your business. Chicago web designers denounce the use of images other than your own. Many businesses working on their own web design grab images off of Google and plant them into their site. This is actually a big mistake, as it is illegal and will result in serious fines when your site is discovered. It is always better to buy images up front than to get heavy fines later on. Speaking of buying images, stock images can work great but it is recommended if at all possible that any business uses their own images as well. This is more important for some businesses than others, but certainly gives the feel of professionalism and realness to the client. Content should be original. A website should portray a business. This business should be original, innovative, and of high quality to please customers. Thus, it is never a good idea to use content from another business or directly imitate them. Further, do not copy your own content that you have already used, as this will not only be boring for the consumer; the search engines notice copied content and will in turn not rank your site for that content, as it has already been published elsewhere. Responsive websites are very important and can be found with the majority of website templates today. A huge portion of web users stick to mobile or tablet devices, so a business must ensure that their page is easily accessible to all users, regardless of device. One of the common web design mistakes is that mobile sites are an upgrade for the future; if you are making your site now, what are you waiting for? Bigger doesn’t mean better. Having a nice logo that grabs attention is fantastic. Having a giant logo does not make it any better. So, when creating a website, it is important to size things that will appeal to the consumer. A visual hierarchy, placing the most important elements in a bigger font and making less important elements smaller, can solve sizing issues. Chicago web designers stress that less can even be more. Minimal pages are often the most appealing to viewers, who get overwhelmed when a page is full of too much content and they then cannot find anything. A page with only the necessary elements and ample blank space if often the page that most attracts consumers. The idea that a website is all a business needs is a common misperception in web design. In fact, a website acts as a foundation. Creating a website is a good base, but requires the use of inbound marketing, social media profiles, and more that are to be incorporated into the website. This will make the site more appealing to the viewer, and give both the business and the site more chances to be discovered around the Internet. Your business’ site should definitely have the general information that would be found in a brochure. But, the beauty of a website is that it can provide so much more. A website is a chance to educate through blogs and supplemental information pages, a chance to give elaborate information about your business, and a chance to get potential clients to interact with you. Use calls to action and landing pages to get customers to reach out to you or request more information. Integrate email and social media features to allow these viewers to share your website and promote your business. The last of the list of common web design mistakes is about investment. All too often, both businesses creating a website on their own and those enlisting help from our Chicago web designers think that building a site is a one time job. Your website is an investment. Creating a website is the major step in building your internet brand, but it requires maintenance. Content needs to be generated and regenerated. Search engine optimization is a continuous process to get your website ranked higher. Marketing is always a must. Innovations in design and layout are necessary. To keep your website relevant, you will need to pay continuous attention to it and maintain your image. 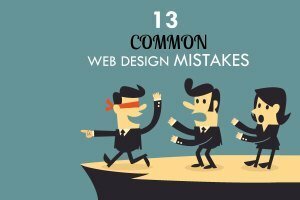 These 13 common web design mistakes are the errors that our Chicago web design firm witnesses everyday. How many of these mistakes are you rethinking? Contact the Design & Promote team to discuss these misconceptions and more, and to get a customized web design plan for your business.